It’s been a while since I made something to contribute to the #365Recipes project, but here you go! Who doesn’t like a nice warm, cozy bowl of creamy pasta? On these cooler fall nights, it’s one of my favoritest things to eat. 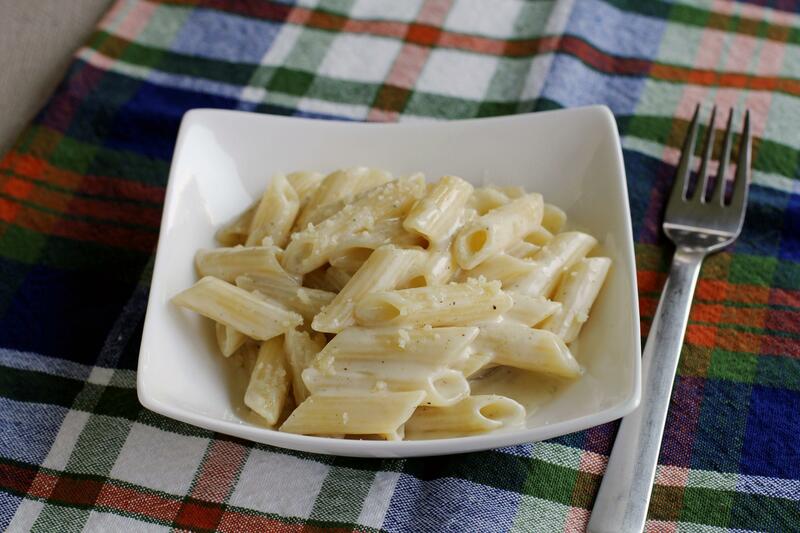 This penne with four cheeses pasta recipe is one I dug out from the bottom of my recipe archives, and old favorite that I had long forgotten about, after omitting grains from my diet for so long. When I saw it sitting in my old recipe binder, I immediately remembered it – the smell, the creaminess, the pungent, grown-up flavor of grown-up cheeses. I just love comfy pasta dishes, I could actually inhale them but I try to be a civilized human being whenever possible. This dish is easily halved for smaller portions, and would reheat well if you could heat it slowly with a little bit of milk or cream to keep the cheese sauce intact. Cook pasta in boiling water until al dente, and drain. Meanwhile, heat butter and cream in a saucepan and whisk together over low heat until butter has melted. Stir in all of the cheeses, and continue whisking until they have all completely melted. Season with salt and pepper to taste. Pour the drained pasta back into the pot you cooked it in, and pour the sauce over top. Stir to combine, keeping warm over medium-low heat. Serve hot, along with additional Parmesan cheese if you wish.